Bardeen was born on May 23, 1908, in Madison, Wisconsin. His parents introduced him to mathematics and logic at a young age, always encouraging his intellectual development. He received a bachelor’s degree in electrical engineering from the University of Wisconsin in 1928 and a doctorate in mathematics and physics from Princeton University in 1936. 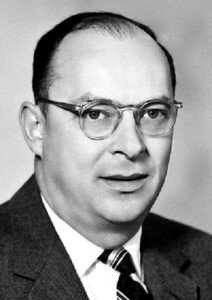 Taking a job in 1945 at Ball Telephone Laboratories (now called Bell Labs), Bardeen joined Walter Brattain and William Shockley in the study of semiconductors, materials that conduct electrical current moderately well. Semiconductors have electrical properties that can be altered by change in temperature or amount of incident light (the amount of light striking them) or by the addition of impurities. In 1948 the teams investigation yielded the transistor, a device that acted both as a rectifier, translating alternating current into direct current, and as an amplifier of current. The transistor was an improvement over the diodes and triodes used from the early 1900s in electronic equipment; it was rugged and small, used little energy, and required neither heating nor vacuum. Transistors revolutionized electronics. Bardeen, Brattain, and Shockley shared the 1956 Nobel Prize for Physics for their invention. Bardeed’s next project concerned superconductivity, first described in 1911 by Dutch physicist Heike Kamerlingh­ Onnes as the ability of some metals to exhibit zero resistance to the flow of electrons at temperatures close to absolute zero or ­273°C. Superconductivity offered a potential solution to the energy wasted ­by electronic devices in overcoming electrical resistance, but it was little understood when Bardeen began to study it in the 1950s. Bardeen and colleagues Leon Cooper and John Schrieffer formulated a complex mathematical theory of superconductivity in 1957. Their explanation, thereafter called the BCS theory, accounted satisfactorily for all observed phenomena associated with superconducting materials. This breakthrough earned them the 1972 Nobel Prize for Physics. Retiring in 1975 from the University of Illinois, where he taught from 1959, Bardeen died on January 30, 1991, in Boston, Massachusetts. Bardeen contributed to two of the most revolutionary aspects of twentieth­century technology—the invention of the transistor and the understanding of superconductivity. The introduction of the transistor was followed by the rapid development of modern electronics. The manageable size and small energy requirement of transistors made them the ideal electrical­ control device for electronic machines. Portable radios, electronic telephone switches, televisions, amplified musical instruments, video cameras, smoke detectors, stereos, calculators, and microphones all would have been impossible without the transistor. All modern electronic devices—those that use electricity or magnetism to influence the flow of electrons—contain one or more transistors. The computer represents perhaps the most significant legacy of the transistor. Computer microchips, the source of computing power, are slices of silicon etched with miniature transistors. Computers and computerized equipment, used to perform an enormous number of diverse tasks, have become one of the most universal and indispensable tools of modern life. Superconductivity is a focus of advanced technological research in various fields. One area is transportation: engineers are investigating the possibility of constructing a railway train run on rails made of superconducting material. Electronics have also benefited from the BCS theory of superconductivity. In 1962 British physicist Brian Josephson formulated the theory of electron tunneling between superconductors; the phenomenon led to fast­ switching devices for computers. In 1986 Swiss physicist Georg Bednorz discovered materials that exhibit superconductivity at 35 degrees above absolute zero. The following year that temperature was raised to 90 degrees above absolute zero, which makes the materials usable in specialized experimental electronics. In 1993 researchers made a compound of mercury, barium, and copper that becomes superconductive at 133 degrees above absolute zero (which is still 140 degrees below 0§C). The pursuit of higher temperatures continues. Posted on March 4, 2015 by Natalie. This entry was posted in Inventors and tagged nobel prize. Bookmark the permalink.